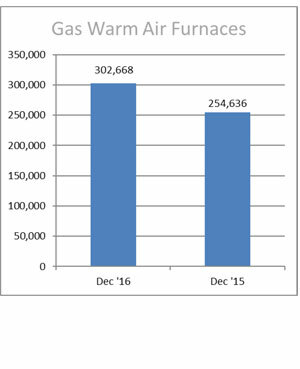 U.S. shipments of residential gas storage water heaters for December 2016 increased 1.3 percent to 387,063 units, up from 381,971 units shipped in December 2015. 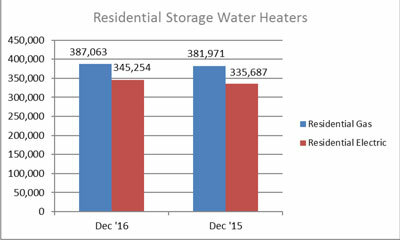 Residential electric storage water heater shipments increased 2.8 percent in December 2016 to 345,254 units, up from 335,687 units. For the year-to-date, U.S. shipments of residential gas storage water heaters decreased 3.8 percent to 4,208,984, compared to 4,374,199 shipped during that same period in 2015. Residential electric storage water heater shipments decreased 2.2 percent year-to-date to 3,937,936 units, compared to 4,027,067 shipped during the same period in 2015. Commercial gas storage water heater shipments decreased 19.2 percent in December 2016 to 7,519 units, down from 9,305 units shipped in December 2015. 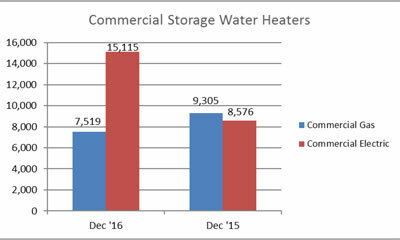 Commercial electric storage water heater shipments increased 76.2 percent in December 2016 to 15,115 units, up from 8,576 units shipped in December 2015. Year-to-date U.S. shipments of commercial gas storage water heaters decreased 1.1 percent to 97,026 units, compared with 98,095 units shipped during the same period in 2015. Year-to-date commercial electric storage water heater shipments increased 44.3 percent to 127,344 units, up from 88,251 units shipped during the same period in 2015. 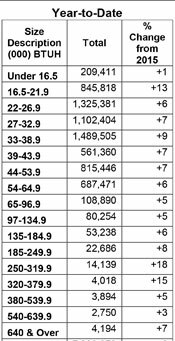 U.S. shipments of gas warm air furnaces for December 2016 increased 18.9 percent to 302,668 units, up from 254,636 units shipped in December 2015. 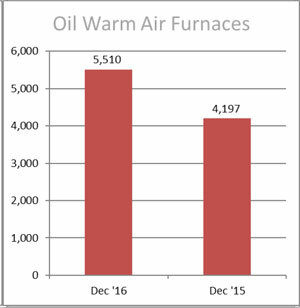 Oil warm air furnace shipments increased 31.3 percent to 5,510 units shipped in December 2016, up from 4,197 units shipped in December 2015. 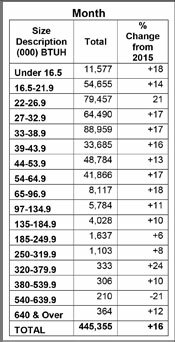 Year-to-date U.S. shipments of gas warm air furnaces increased 4.6 percent to 2,942,545 units, compared with 2,814,203 units shipped during the same period in 2015. Year-to-date U.S. Shipments of oil warm air furnaces decreased 4.4 percent to 37,743 units, compared with 39,494 units shipped during the same period in 2015. U.S. shipments of central air conditioners and air-source heat pumps totaled 445,355 units in December 2016, up 16.5 percent from 382,402 units shipped in December 2015. U.S. shipments of air conditioners increased 14.7 percent to 281,407 units, up from 245,322 units shipped in December 2015. U.S. shipments of air-source heat pumps increased 19.6 percent to 163,948 units, up from 137,080 units shipped in December 2015. 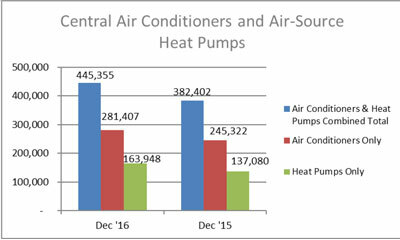 Year-to-date combined shipments of central air conditioners and air-source heat pumps increased 7.6 percent to 7,330,859 units, up from 6,815,317 units shipped in December 2015. Year-to-date shipments of central air conditioners increased 7.8 percent to 4,900,992 units, up from 4,545,855 units shipped during the same period in 2015. The year-to-date total for heat pump shipments increased 7.1 percent to 2,429,867 units, up from 2,269,462 units shipped during the same period in 2015.